Most people only know Lucian Piane as the man behind the lyrics of RuPaul and they may not know that he has recorded some of his own tracks as well. 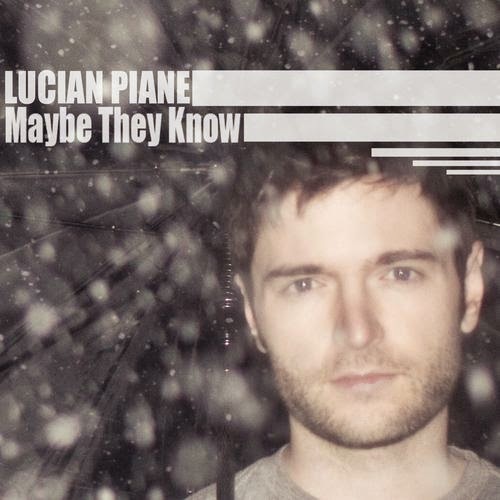 Way back in November of 2010, Lucian released, "Maybe They Know"; an EP that has 2 tracks on it "Maybe They Know" and "Tell Me, Tell Me". Both of these songs are gorgeous and could easily stand up to any artist on the pop charts. Neither song sounds dated and both have an exceptionally timeless quality to them. They are brilliantly structured and just have an ease of purpose to them. "Maybe They Know" is a languid traipse through a relationship and how it's perceived that just gently brings you along with it. The song makes absolutely no demands from the listener, only that you're there as it draws you from start to finish. Lucian's vocals over the verses are set about the same volume as the track which allows them to simply become part of the whole. It's not until the chorus where the vocals are a bit louder and you pay attention to what he's saying a little more than you had previously. Programming like this can be tricky if it's not done right and you can cause listeners to pull away from the track but this is done just right and builds the right amount of drama into the track. It makes you lean into your speakers/earbuds a little deeper which makes you become more involved in the track. "Tell Me, Tell Me" is vaguely reminiscent of a song that would have been released alongside a Beatles track. There's something a bit mod about it and the overall quality of the song is just this dreamy romance of a song that I get lost in every single time I listen to it. I've written entire movies in my head around this song and have cast it with every conceivable cast known to man. The instrumentation in the song is so strong, the strings, the percussion - hell even the xylophone is carefully used in the song to fill it out into this gorgeous number. It starts as two lovers are talking about what the future holds and turns as they run into each other after an extended time apart and while there's not an immediate rush of emotion, there is a build up of feelings about how long they've been apart and how things have changed over the years. I think it's a song that talks about not taking for granted the relationships you have because in the blink of an eye, you'll be standing on a street corner after you've run into that person you haven't thought about in years and you'll be awash with years of "could haves". I wish there was more of his catalog out there because he not only has a brilliant way with words and the crafting of music but his voice is simply gorgeous. I hope he reads this and sees that there is a want/need for him to step out on his own every now and then and let his voice be heard.